Metro Transit’s light-rail vehicles are becoming even more weather-hardened. Pantographs that are specially-equipped to cut through ice on overhead wires are being installed on all 27 Bombardier light-rail vehicles and 32 of the newer Siemens light-rail vehicles to improve winter weather service on the METRO Blue and Green lines. Mounted atop each light rail vehicle, pantographs transfer energy from the overhead wires to the train. The connection between the pantograph and the overhead wire, also known as catenary, is made by a long metal strip. To reduce wear on the overhead wire, the carbon strips have a smooth surface. But that smoothness is less effective at cutting through ice so textured, copper strips are used whenever severe weather threatens. In past seasons, rail vehicle maintenance staff has replaced the strips each time ice was in the forecast. Because that is a labor intensive and time consuming process, trains are being equipped with an additional pantograph with textured contact strips that can be raised and used as needed. The ability to respond quickly has become more important as Metro Transit’s light rail vehicle fleet has expanded to nearly 90 trains serving two light rail lines. “We have to be able to deploy them (light-rail vehicles) immediately or you’ll never be able to keep up,” said Rick Carey, assistant director of light-rail vehicle maintenance. 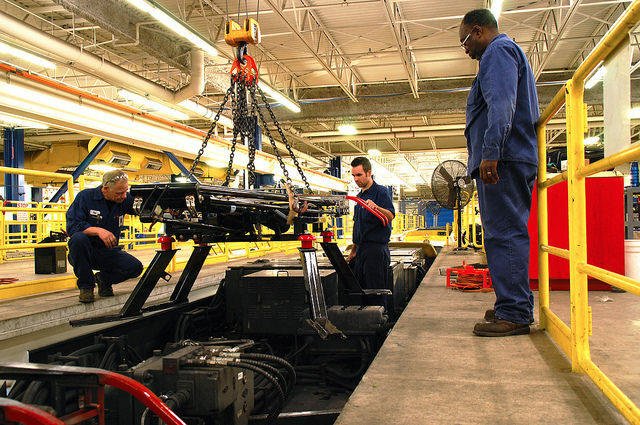 The new pantographs come largely assembled but the brackets used to mount the equipment on top of the train were designed in house and are fabricated by maintenance staff. To install the pantographs, the equipment is hoisted above the train, welded into place and then wired. The entire process can take up to eight hours. Electro-mechanical technicians Chris Kostohris and Tom Astedt are responsible for assembling the brackets and putting the pantographs on the trains. The installations began in August and will continue through the winter months. Astedt said he likes the work because each vehicle poses a new challenge. Each train is a little different, so Astedt and Kostohris carefully measure and level each new pantograph to fit the space. The ice-cutting pantographs aren’t the only all-weather feature on the light-rail trains. Each train comes equipped with a snowplow that pushes snow out of the rail right of way. The trains are also heavily insulated and heated to keep customers comfortable during cold weather. > How does Metro Transit prioritize winter storm cleanup?